The Web is a curious beast. How the Web looks and functions is perpetually dictated by how audiences consume content. It’s no secret that more online content is being consumed on phones and tablets. And the need to have content and functionality for any size screen has had a profound affect on web design. So, it’s time to gaze into the crystal ball for the web design trends to look for in 2017. The trend towards long scrolling pages (especially home pages) is not new to 2017, and will continue into the foreseeable future. Before the age of mobile viewing, designers and marketers felt a need to cram every bit of important content above a virtual “fold.” Now, with a countless variety of screen sizes and responsive, stackable page layouts, even B2B audiences expect to scroll. And that’s a good thing. From a design perspective, giving content breathing room helps make pages more digestible and aesthetically pleasing. From a marketer’s perspective, well-crafted long scrolling pages can potentially increase visit duration, reduce bounce rates and provide more opportunities for visitors to engage with calls to action. Some argue that content divided into multiple shorter pages allows users to quickly access the content they want most. However, most site visitors are only willing to wait for the first page to load, but not for the next. This is especially true for mobile, where page load times tend to be longer. So it’s preferable to use longer scrolling pages to minimize the risk of visitors clicking away from your site. The longer scrolling pages previously mentioned call for on-page navigation elements (called anchors) to help users quickly get to a desired section of a page. 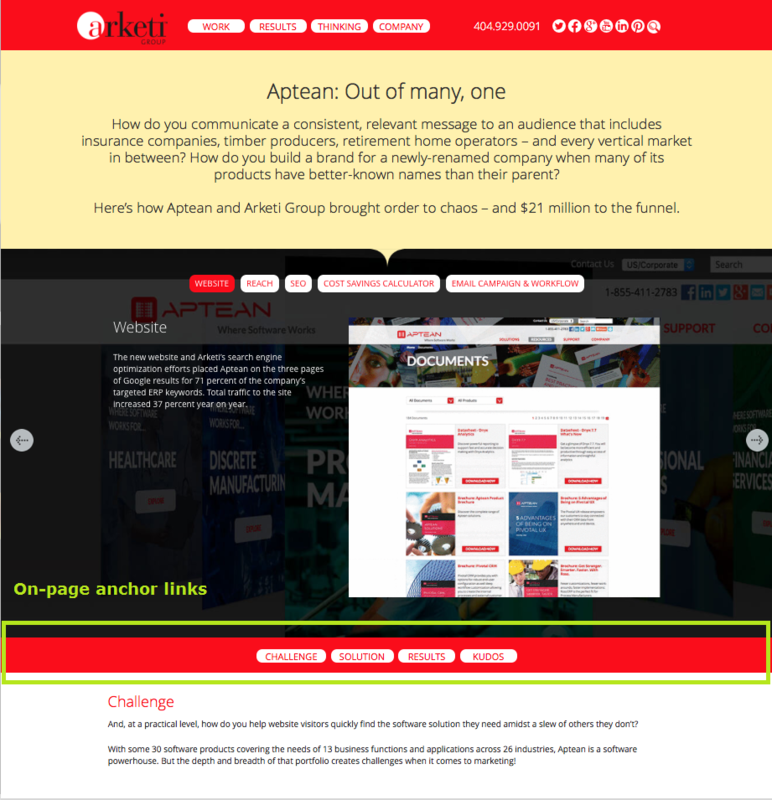 The Arketi case study page shown below is good example of this trend in action. In addition to anchors, “back-to-top” buttons also eliminate tedious manual scrolling and will continue as a UX design trend and best practice. This divisive little bugger has been the subject of many a debate among UX and web designers. Like it or not, thanks to the influence of mobile devices, it’s here to stay. One strategy you will see more of in the coming year is a combination of the hamburger icon with a “menu” label. It has been shown via A/B testing that the combination of the icon and label is more effective than just the hamburger alone. In general, whether or not companies use the hamburger on their websites, you will most likely notice a shift to even fewer immediately visible items in a site’s main navigation. Where the convention once was seven visible items in a main navigation, many companies, such as Microsoft.com, are opting for as few as three. 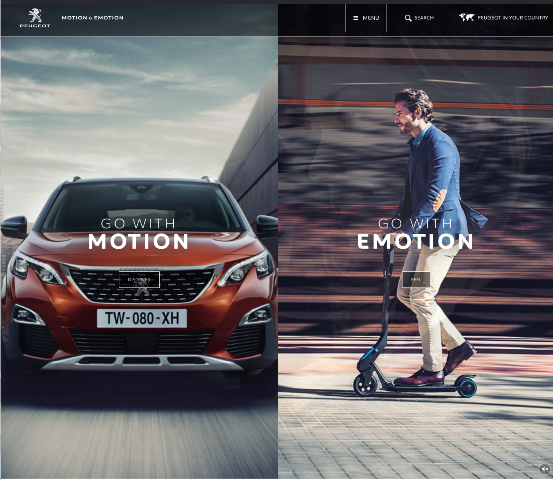 The split-screen layout may possibly be one of the most noticeable website design trends in 2017. The benefit of this design approach is that it provides distinct content divisions and creates greater focus on important information. It also potentially reduces scrolling for desktop viewing without requiring page content reduction. This approach is highly effective on pages with two side-by-side options to select or pages with forms. The one caveat for this approach is designers need to have a plan for how a split-screen design will display on mobile. Another trend we will see more of is full-screen forms. There may be no better way encourage visitors to share their information than this approach to information gathering. Modern full-screen forms are more user-friendly than conventional forms as they display only one input field at a time with more engaging prompts. A good example can be found on JotForm. They say a picture tells a thousands words. So how many does video tell? Regardless, videos get noticed. When used as background loop, video can convey a company’s offerings in a matter of seconds. Video can keep visitors on your site longer when used as calls to action . According to a recent HubSpot Consumer Behavior Survey, 55 percent of participants said video is the most thoroughly consumed online content. That prolonged visit time is the real value of video and why we expect to see even more video in 2017. The one thing we know for certain is the Web will continue to become more responsive, nuanced, and interactive. As visual and UX designers push what’s possible, developers will need to make sure sites load fast and function optimally across a myriad of devices. So enjoy the 2017 Web, it should be a great ride.